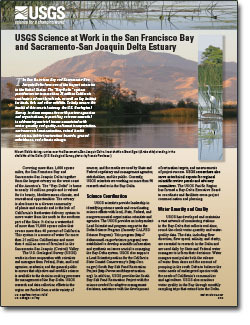 The Bay-Delta is a nexus for challenging issues about water, ecosystems, and human use. USGS science helps address key problems and uncertainties. The Salton Sea is facing many challenges as inflows and water levels decline. USGS science helps identify problems and evaluate possible solutions. Monitor effects of drought through data collection & research. Study the current drought. Support successful planning & science-based decision-making. Scientists conduct a wide array of basic and applied research to better understand the natural hazards of earthquakes to protect lives and property. To understand the physical impacts of climate change and sea-level rise, we research rates, causes, and consequences of land and climate change. The USGS Pacific Regional Directors Office is located at 6000 J Street, Placer Hall, Sacramento, CA 95819. For more information, please contact (916) 278-9551. We help support the USGS mission by providing objective science and technical support to address a wide array of important societal issues, our capabilities and activities are diverse. An international team of scientists just finished probing the depths of the Pacific Ocean offshore of Alaska and British Columbia, to better understand the Queen Charlotte-Fairweather Fault. During the past century, the 700-mile-long fault has generated at least half a dozen major earthquakes, and future shocks threaten coastal communities in both the United States and Canada. Editor: In the public interest and in accordance with FAA regulations, the USGS is announcing this low-level airborne project. Your assistance in informing the local communities is appreciated. The U.S. Geological Survey awarded approximately $4.9 million this week to six universities and a university-governed non-profit, to support transitioning the west coast “ShakeAlert” earthquake early warning system into a production system. Masteller, Claire C; Finnegan, Noah J; Warrick, Jonathan A.; Miller, Ian M.
66. Masteller, C.C., N.J. Finnegan, J.A. Warrick, and I.M. Miller, 2015, Kelp, cobbles, and currents: Biologic reduction of coarse grain entrainment stress. Geology, v. 43, no. 6, p. 543-546. Shouse, Michelle K.; Cox, Dale A.
USGS science at work in the San Francisco Bay and Sacramento-San Joaquin Delta estuary; 2013; FS; 2013-3037; Shouse, Michelle K.; Cox, Dale A. Calculation of hydrocarbon-in-place in gas and gas-condensate reservoirs - Carbon dioxide sequestration; 2012; OFR; 2012-1033; Verma, Mahendra K.
USGS is the nation's premiere earth and natural science research organization. Because our core mission is to provide objective science and technical support to address a wide array of important societal issues, our capabilities and activities are diverse. Our work is conducted by employees at our Science Centers, and in collaboration with our many external partners. Invasive species are considered to be second only to habitat degradation in terms of negative impacts on the Earth’s ecosystems, and our scientists make up a significant proportion of the global expertise in the rapidly-growing problem of invasive reptiles. Contacts: Robert Reed, Ph.D., Patrick D Barnhart, Amy Yackel Adams, Ph.D. Contacts: Michelle Reynolds, Ph.D., Jeffrey Hatfield, Ph.D.
Deserts in the southwestern United States are experiencing rapid changes due to human activities. The growth of human populations and development of cities and towns affect adjacent rare, threatened, and endangered species and their associated ecosystems in the Mojave and Sonoran deserts of southeastern California, southern Nevada, southwestern Utah, and western Arizona. The Brown Treesnake is a highly destructive reptile species that has extirpated many native species of birds, bats, and lizards from the U.S. Territory of Guam. For more than two decades branch scientists with the Invasive Reptile Project have developed, validated, and tested the feasibility of Brown Treesnake control and suppression at various spatial scales. Contacts: Robert Reed, Ph.D., Amy Yackel Adams, Ph.D., Melia Nafus, Ph.D.
Would you like to learn more about USGS National Map products and services? Then welcome to the National Geospatial Program User Engagement office. We can help you leverage NGP products and services through The National Map and other venues. Connect with us through our network of National Map Liaisons. There's a liaison for every state! Scientists perform a range of studies that document, assess, and model coastal change, risk, and vulnerability. Studies include historical shoreline change, the geologic structure and history of coastal regions, sediment supply and transport, sea-level rise, and how extreme storm events affect rates and impacts of coastal change. We study the distribution and hazard potential of coastal and submarine events such as earthquakes and submarine landslides and associated tsunami potential, hurricane induced coastal inundation, extreme storms, sea-level rise and oil and gas spills. We also model development to help evaluate and forecast coastal hazard probability and occurrence. Our scientists conduct research studies focused on geologic mapping, sampling and understanding of mineral and energy resources and studies of the geologic setting and processes to inform renewable energy development offshore. We bring together multidisciplinary expertise focused on developing tools and models to improve understanding of how healthy ecosystems function as well as how they respond to environmental changes and human impacts including ecosystem restoration. Research studies address coral reef, coastal wetland, benthic habitat and groundwater resources. USGS is known for the producing objective, high-quality data that is relevant to decision-makers, resource managers, the scientific community, and the public. We are recognized as the world leader in making data and tools readily available; as a result, our tools and data are widely used to better understand our world and protect human life and property. Site provides access to Coastal and Marine Geology Program (CMGP) data via Open Geospatial Consortium (OGC) standards services; serving data to GeoMapApp and Virtual Ocean 2-D and 3-D earth browsing tools, for data integration, visualization and analysis; and metadata catalogs for data discovery. The 3DEP products and services available through The National Map consist of lidar point clouds (LPC), standard digital elevation models (DEMs) at various horizontal resolutions, elevation source and associated datasets, an elevation point query service and bulk point query service. All 3DEP products are available, free of charge and without use restrictions. This portal contains U.S. Geological Survey (USGS) video and photography of the seafloor off of coastal California and Massachusetts, and aerial imagery of the coastline along segments of the Gulf of Mexico and mid-Atlantic coasts. These data were collected as part of several USGS Coastal and Marine Geology Program Seafloor Mapping projects and Hurricane and Extreme Storm research. 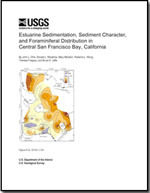 GIS data files for map areas offshore of California are listed with a brief description, a small image, and links to the metadata files and the downloadable data files. USGS is a world leader in producing and distributing maps and geospatial data, ranging from local to national scales. Links to publications that contain maps of the sea floor or lake beds and the digital data used to create them. This portal is a “go to” source for maps related to ocean and coastal mapping. Information is organized by geography or region, by theme, and by the year data was published. Bouse, Robin M.; Fuller, Christopher C.; Luoma, Samuel N.; Hornberger, Michelle I.; Jaffe, Bruce E.; Smith, Richard E.
Chin, John L.; Woodrow, Donald L.; McGann, Mary; Wong, Florence L.; Fregoso, Theresa A.; Jaffe, Bruce E.
Estuarine sedimentation, sediment character, and foraminiferal distribution in central San Francisco Bay, California; 2010; OFR; 2010-1130; Chin, John L.; Woodrow, Donald L.; McGann, Mary; Wong, Florence L.; Fregoso, Theresa; Jaffe, Bruce E.
Bearman, J.A. ; Friedrichs, Carl T.; Jaffe, B.E. 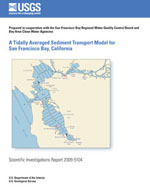 ; Foxgrover, A.C.
Spatial trends in tidal flat shape and associated environmental parameters in South San Francisco Bay; 2010; Article; Journal; Journal of Coastal Research; Bearman, J. A.; Friedrichs, C. T.; Jaffe, B. E.; Foxgrover, A. C.
Winder, Monika; Cloern, James E.
The annual cycles of phytoplankton biomass; 2010; Article; Journal; Philosophical Transactions of the Royal Society B: Biological Sciences; Winder, M.; Cloern, J. E.
Lionberger, Megan A.; Schoellhamer, David H.
A Tidally Averaged Sediment-Transport Model for San Francisco Bay, California; 2009; SIR; 2009-5104; Lionberger, Megan A.; Schoellhamer, David H.
Complex seasonal patterns of primary producers at the land-sea interface; 2008; Article; Journal; Ecology Letters; Cloern, J. E.; Jassby, A. D.
Lionberger, Megan A.; Schoellhamer, David H.; Shellenbarger, Gregory; Orlando, James L.; Ganju, Neil K.
Box Model of a Series of Salt Ponds, as Applied to the Alviso Salt Pond Complex, South San Francisco Bay, California; 2007; SIR; 2007-5173; Lionberger, Megan A.; Schoellhamer, David H.; Shellenbarger, Gregory G.; Orlando, James L.; Ganju, Neil K.
Western ground water and climate change—pivotal to supply sustainability or vulnerable in its own right? Measuring streamflow in northern Nevada. USGS technician measuring streamflow in northern Nevada. Measuring streamflow in the Sisquoc River near Garey, California. USGS technician measuring streamflow in the Sisquoc River near Garey, California, upstream of the Santa Maria Mesa Road Bridge. USGS Streamgaging on the Pit River operates year round. USGS Streamgaging equipment and cableway on the Pit River near Canby, California operates year round. Lowering an acoustic Doppler current profiler from a cable way. USGS technicians preparing for a streamflow measurement by lowering an acoustic Doppler current profiler from a cable way on the American River near Fair Oaks, California. Technicians prepare to board a boat to measure water flow. USGS technicians prepare to board a boat to go out to the center of the channel in the San Joaquin River below Friant Dam to get an accurate measurement of water flow during releases from the Dam for flood control. Measuring streamflow in fast moving floodwater. USGS hydrographer measuring streamflow using a handheld Acoustic Doppler Velocimeter in fast moving floodwater Cajon Creek near Keenbrook, California. USGS Streamgaging Station in northern Nevada. USGS geologist Carol Reiss examining hydrothermal vent sample using hand lens. Sulfide-silicate minerals precipitate from 330°C mineral laden water venting along volcanically active spreading ridges. Research and technical support provided by USGS makes a difference Some recent press releases and media advisories from the Pacific Region are highlighted below. A new U.S. Geological Survey-led study suggests that earthquake-related deformation just below the Earth's surface can be quite different from how it is expressed at the surface. Direct encounters with humans can increase the likelihood that nesting geese will lose their eggs to predators, according to a recent study released Monday, July 17. Scientists from the USGS Pacific Coastal and Marine Science Center mapped the offshore extent of the Mud Creek landslide on California’s Big Sur coast on July 11, 2017. Vast mineral wealth has been discovered in the Great Basin since the 1800s. As each new generation of prospectors and geologists brings their cutting-edge tools with them, the arid ridgelines of the desert Southwest have shown more and more potential. Although no one can reliably predict earthquakes, today’s technology is advanced enough to rapidly detect seismic waves as an earthquake begins, calculate the maximum expected shaking, and send alerts to surrounding areas before damage can occur. This technology is known as “earthquake early warning” (EEW). Nine USGS Science Centers are administered by the Pacific Regional office, which is headquartered in Sacramento, California. The Pacific Region works with a wide array of partners across the country, including other Federal and state agencies, regional and local governments, academic institutions, research organizations, non-governmental organizations, and more.